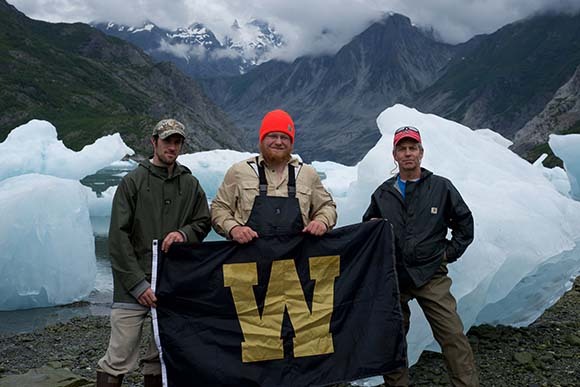 This summer Dr. Wiles, Nick, Jesse Wiles, and myself traveled to Glacier Bay National Park and Preserve. 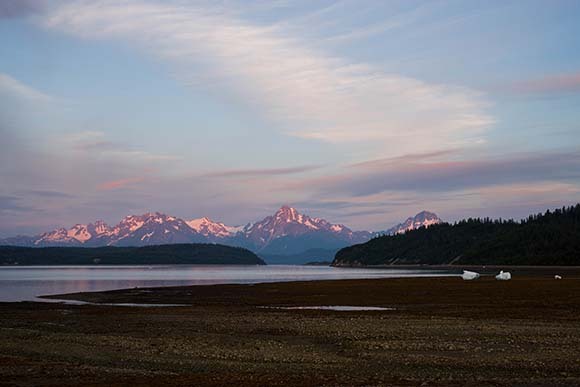 We spent our six days in upper Muir Inlet at Wolf Point. 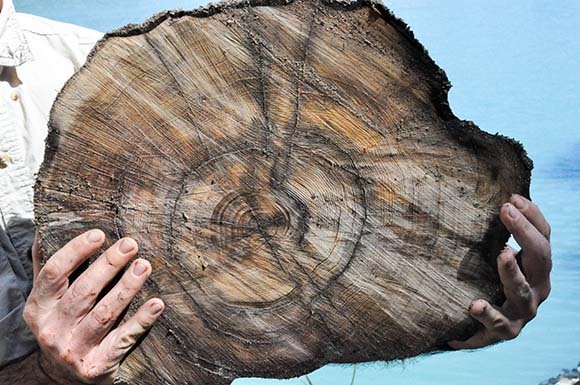 Our purpose this summer was to bridge a crucial gap in the tree ring record around 1700-2000 years B.P. 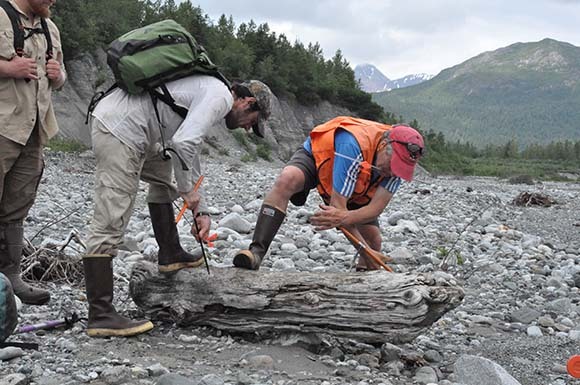 As well as bridging the tree ring record gap, we are aiming to provide a better glacial history for the region. 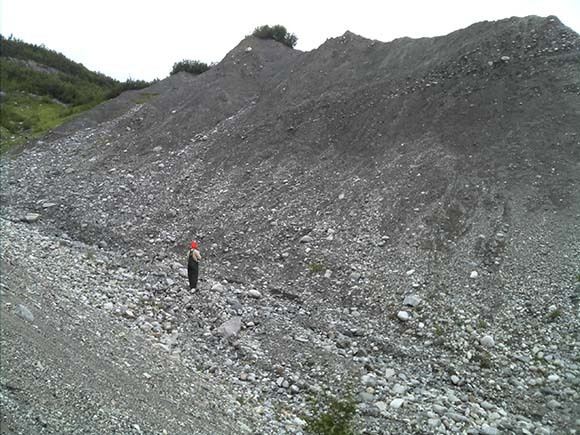 While we were there, we collected 22 sections and 13 cores. The sections and cores are sitka spruce and mountain hemlock. 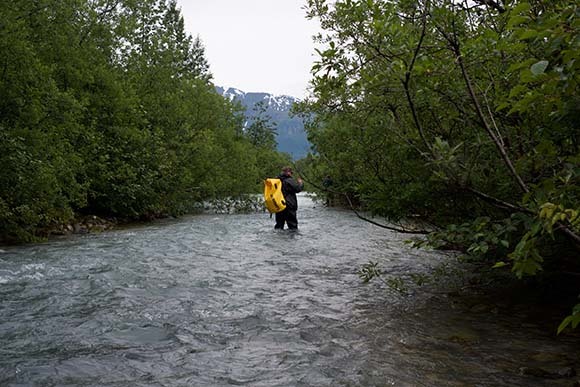 We collected samples from McBride Inlet, Wolf Point Creek, Nunatak Mountain, White Thunder Ridge, and Stump Cove. We also scouted some other promising areas for future projects. All pictures used in this blog were taken by Jesse Wiles. Our first day in the park at McBride Inlet. 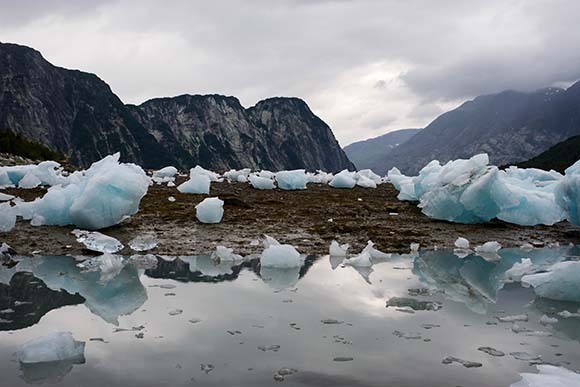 The large icebergs in the background are everywhere in the inlet due to the constant calving of McBride Glacier. More icebergs that are washed up on shore during low tide at McBride. 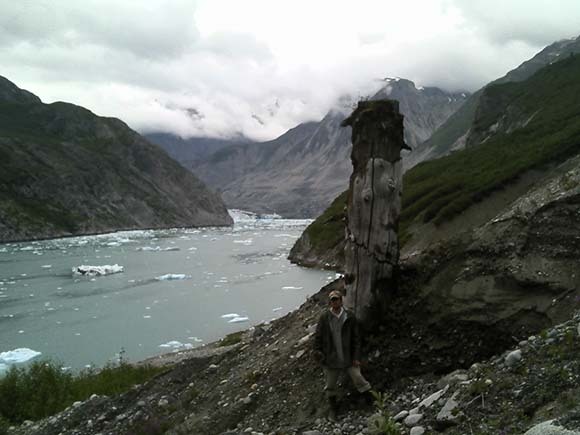 A large spruce stump in situ in a large delta at McBride with Nick for scale. McBride Glacier is faintly visible in the background around the corner. 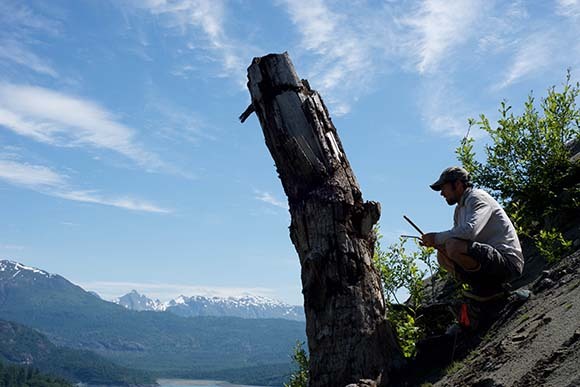 Me searching for logs and taking note of the sedimentology of the delta at McBride. Our second day led us on a strenuous trek through wolf point to get to a promising lake. 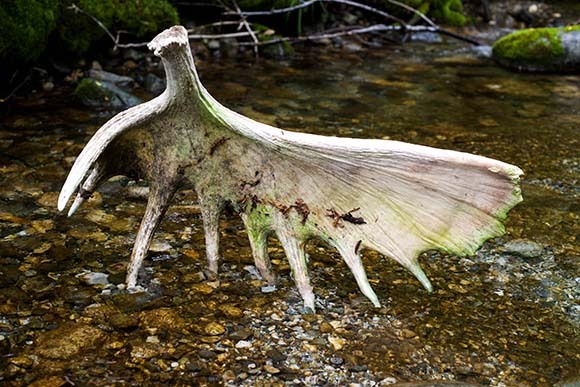 On the way to the lake we found a nice moose shed in a creek. 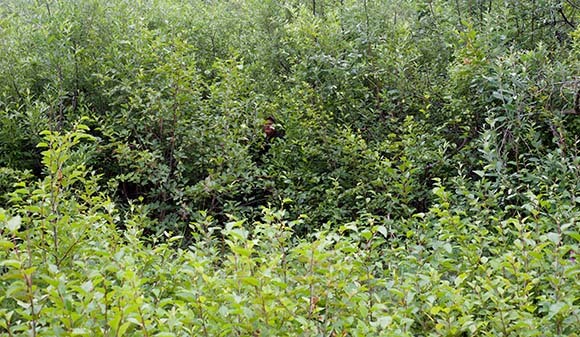 Me crashing through the young alder at the shore of the lake at Wolf Point. After determining that the lake was too much for us to cross in a day, we headed back through a decent size stream. Me knee deep preparing to go back into the brush because of a large set of rapids ahead. Once the clouds and rain subsided, the days and evenings were very clear and the alpine glow on the mountains was a nightly occurrence. Days 3 and 4 were spent at the Nunatak Mountain and fan because on our first attempt we were unable to cross a stream to access the alluvial fan. 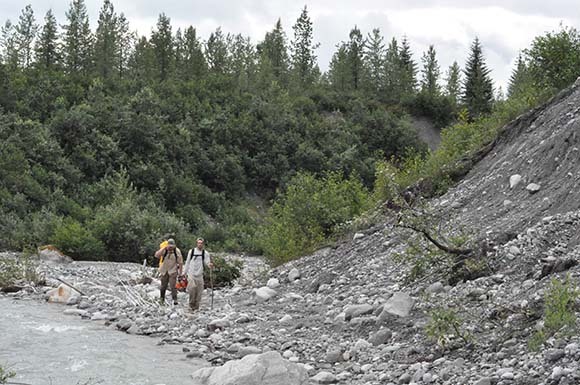 Nick and I walking along a stream and glacial moraine. When we finally made it to the Nunatak Fan on day 4 we found a nice selection of detrital logs through out the fan. Nick and Dr. Wiles core a detrital log while I watch. Since day 5 fell on the Fourth of July, Dr. Wiles decided to have tourist day. We went up the inlet and visited Riggs Glacier. We kayaked around 12 miles up and down the inlet. 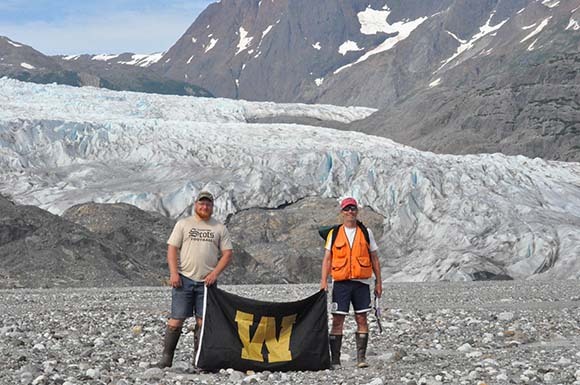 Before we made it to Riggs Glacier, we stopped at an alluvial fan along the inlet at White Thunder Ridge. We found some nice logs. This is an example of a section that was taken from White Thunder Ridge. Day 6, which was our final full day in the field, we went to Stump Cove. 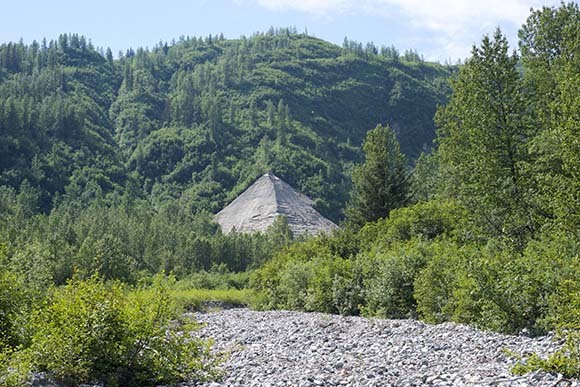 This is a picture of the delta at the bottom of the alluvial fan at stump cove. Nick taking a core of the only other in situ stump we found. The stump was about half way up the large delta at Stump Cove. One of the grizzly bears we saw while in the park. This was a smaller bear that we saw at Stump Cove walking the shore line. 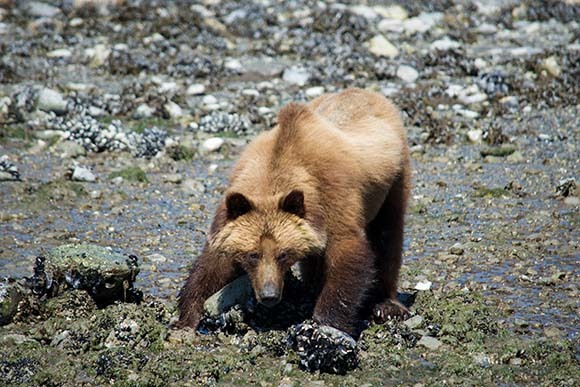 The bears usually came out at low tide to feed on any organisms that got washed up on the shore. They also flip rocks to find food like this bear was doing in the picture. 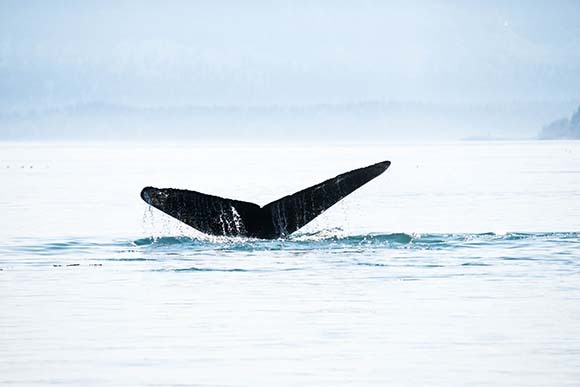 A nice picture of a humpback whale tail we saw on the last day while boating back to the National Park station. While boating in the the inlet, we saw a lot of humpback whale fins and breaches. However, we did not see any orca (killer whale).